Samantha and Travis Liebhard, both 24, met as college freshmen, married right after graduating in 2012, and quickly moved to Minneapolis so that Travis could start his graduate pharmacy program at the University of Minnesota—Twin Cities. They face intimidating debts: Travis has racked up $135,000 in student loans and expects to incur another $60,000 before graduation. Barely making ends meet this year, the couple came up with an idea: Why not cut their $1,500 monthly rent in half by giving up their big two-bedroom apartment and finding room­mates to share a similarly priced four-bedroom unit? So in September, two of Travis’s classmates moved in with the Liebhards. Now Samantha’s $40,000 salary in her public relations job and Travis’s $8,000 pay from a part-time hospital job seem like enough to get by on. Samantha complains about dishes in the sink and clothes left on the floor, but the four roommates get along well. “It’s helping me prepare to have children one day,” she jokes. Retirement seems far away, given the Liebhards’ more urgent financial concerns, starting with the student debt. The couple also want to have kids and buy a house, but Travis won’t be making a full pharmacist’s salary of about $120,000 for another four years; after his expected graduation in 2016 comes a two-year residency, paying about $40,000 annually. Helping the Liebhards navigate their options is Sophia Bera of Gen Y Planning in Minneapolis. The key to success, she says, is to have a reasonable spending plan and take incremental steps. 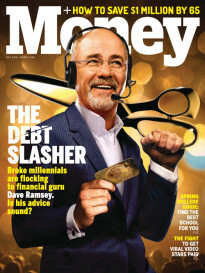 Save in moderation: Given how much Travis owes, plus the 6.8% interest rate on most of his loans, repaying debt should indeed be the couple’s top priority, says Bera. So for now Samantha should only bump up her 4% 401(k) contribution to 6%—enough to get her full match. 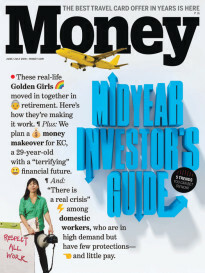 Her 401(k) portfolio—half in a 2020 target-date fund and half in a large-cap U.S. stock fund—is too conservative for her age and not properly diversified, says Bera. Her plan’s 2050 target-date fund, which is 80% in stocks, would be a better choice. Bank some cash: Because the Liebhards have little saved for emergencies, Bera says they should put Travis’s $800 monthly pay­check­—the amount they are saving in rent—into a savings account; the goal is for that to reach $10,000, or three months of their net pay. Next, they need to budget Samantha’s $2,600 monthly take-home pay. Bera suggests $800 for the fixed costs of rent and phones, and $1,500 to be divided between discretionary spending and monthly essentials such as groceries. Attack the debt: The $300 left over in Bera’s proposed budget should go toward paying down interest on Travis’s debt, even though he can defer repayment until after his residency; his current loans are accruing interest amounting to about $7,000 annually. Their payments will likely qualify the couple for an annual $2,500 student loan interest tax deduction over the next few years. Once Travis finishes his residency, Bera says, he should be able to pay off his loans in 10 years at the rate of $2,300 a month, while maxing out his 401(k) contributions ($17,500 is the current annual limit).